I hope everyone had a Happy Thanksgiving and for those who don't celebrate the holiday, there's always something to be thankful for anyway. I just finished up a huge plate of Thanksgiving leftovers along with some cake and pie. Right now, I am about as lazy as could be. I decided this would be a good time to use up some of my leftover photos and video. They are in no particular order. I'll decided to add some brief comments using the bullet method. This turned out to be a mistake because I accidentally deleted photos from this post about 6 times by trying to shorten the space between the photos and paragraphs. Once I deleted them, they had to be uploaded all over again. The top photo is a view of the Connecticut River from the Gillette Castle observation area taken today at the end of a Hartford Audubon Field trip. This is a good area to see Bald Eagles from during the winter. We saw one adult and one immature Bald Eagle here today. 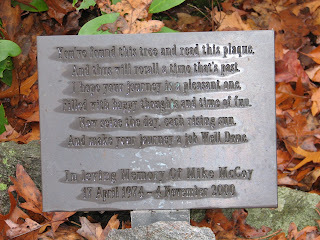 Before stopping at Gillette Castle, we worked off a few calories with a walk through Machimoodus Park in East Haddam. The birds were kind of quiet today but we did manage to see a few interesting species including a Hermit Thrush, Bufflehead and a good-sized flock of Eastern Bluebirds. There were hunters trying to shoot ducks in the cove while we were trying to look at them. A few bird shot even made their way up the hill and into our area. Last weekend I took a ride to a private Simsbury home to see a Calliope Hummingbird. I couldn't resist taking a photo of this chickadee while I was there. I did see the Calliope Hummingbird which is very rare is Connecticut. I think only one other one was seen last year but it must have got the word out to his friends because another one showed up this year in Simsbury. It was really nice that the owner let people up on the deck to view the hummingbird. There was no morning light where the photo was taken and I didn't want to use the flash. The owner of the house is into sports and is betting his Calliope Hummingbird will stick around longer than last year's Calliope Hummingbird. He calls the bird Charlie and keeps it's feeder well stocked with nectar. This young deer was feeding on the grass about 10 feet away from road workers along Research Parkway in Meriden and didn't seem to have a worry in the world. I saw my first Hooded Mergansers of the Fall last weekend. I like them so I took a picture of them. That's all I have to say about that. I posted one photo of a Palm Warbler from my October camping trip already but I like the way the sunlight shows the yellow underneath the tail of this one. Here is a video of Theresa Kramer talking at the Northwest Park Nature Center during Hartford Audubon's Family Day which took place on October 5th. I hadn't posted this previously. I will post it now so I can delete it from my computer. Here is a video from last weekend of a Red-tailed Hawk getting mobbed by crows. Now I am going to relax and read a book but I'll be back out searching for birds tomorrow morning. Hope you enjoyed my Thanksgiving Leftovers! Last Saturday (11/16/08) I took a ride to the ponds along Research Parkway in Meriden, CT. I wanted to see if I could relocate the Eurasian Wigeon that Vern had spotted when he made his visit to Connecticut. There were still plenty of American Wigeons as well as a Northern Pintail, but the Eurasian Wigeon must have been hiding somewhere. I was talking to a young birder, (a guy in his early 20's, if that) who was telling me about his birding adventures over the last year. He had come into some money and decided to drive all the way to Alaska and build his list of birds along the way. As we were talking, a third birder came along and informed us of a Barnacle Goose that had just been seen on a farm off of North Branford Road in Wallingford. I thanked him for the information and within 15 minutes I was at the farm. I found the Barnacle Goose mixed in with a flock of Canada Geese. It's markings were very distinct. The white face and black that extended down to the breast made the bird easy to pick out with binoculars. It was the first time that I had seen one and I was very impressed by it's appearance. At the same farm there was an added bonus. 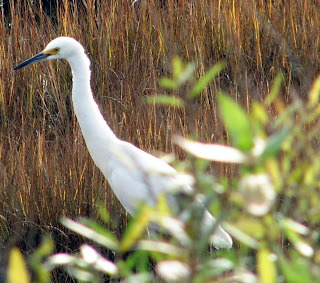 It has an orange bill but it's too small to be a Great Egret and Snowy Egrets have a black bill. This bird seems to have shorter legs and is a little bit chunkier than a snowy. The reason it doesn't fit into either category is that this was a Cattle Egret! That is another pretty good bird to see in Connecticut and was also another first for me. It was great to see the Cattle Egret and the Barnacle Goose on the same morning. News had spread quickly of the favorable viewing location of the two rarities. When I see rare bird chasers in action, they remind me of a secret government agency. They should have a special name-How about the AVI (Avian Bureau Of Investigation)? As the convoy of cars arrived, there were cell phones, binoculars, spotting scopes, two way radios, and cameras with giant lenses everywhere. I'm not complaining about it. After all, I was there doing the same thing. It just gets to be kind of amusing at times. As pleased as I was to have seen these two rarities, it would have been more fun if I had found them myself. You have to give credit to the birders who find some of these rare birds. They put in a lot of time carefully scanning through large flocks one by one. Most of the time they don't find anything unusual. Many birders don't have the patience to search through every flock of Canada Geese they come across. I've been trying to make a point to search through large flocks of birds, but apparently I don't do it consistently enough or I probably would have found something besides the occasional Brant by now. 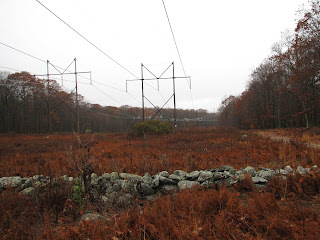 I was on my way to Simsbury, hoping to get a look at the recently reported Calliope and thinking about what I was going to write in this post. I was traveling along Day Hill Road in Windsor and noticed a flock of Canada Geese. Probably just a bunch of Canada Geese and nothing more I thought but I would have felt hypocritical if I didn't stop to take a look. When I first entered the lot, some of the geese took flight before settling down again. I started scanning through the flock. I caught a glimpse of an orange bill on one of the geese in the pond. Probably one of those domestic Graylag geese I thought. I remember being fooled by them before. The orange-billed goose then came out of the pond and started to walk across the grass. It had white behind the bill and orange legs. It had a dark area on the side. The head and body were smaller than what I've seen on Graylags. It turns out that I was rewarded for my efforts because this bird turned out to be the much rarer Greater White-fronted Goose. I was pleased to have found this bird on my own for a change without having to rely on the CT rare bird listserver! This is a short video of the Cattle Egret I saw last weekend. Additional Notes: For interesting information and great photos about the birds mentioned in this, post see Gaggles Of Geese in the November 14th post of Talking Nature With Greg Hanisek. 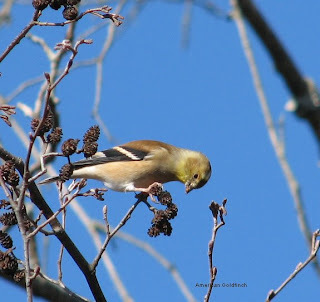 He is very knowledgeable about the population and distribution of birds in Connecticut. He is the guy to ask if you have any questions about birds in Connecticut. Mckenzie Reservoir in Wallingford . The ponds on either side of Research Parkway in Meriden. Traveling down 68 from route 17 in Durham, there is a skating pond on the left, and further down the road there is a game club pond on the right. The Lyman's Orchard Pond in Middlefield. There are also a number of farm fields throughout the area that are worth checking. There are a number of definitions and usages for the word Light in the English language. It is a verb, adverb, noun, adjective and is frequently mentioned in reference to spiritual awareness. For the purpose of this post, I would say that light and the lack of light influenced both my thoughts and actions. I looked out the picture window of my living room at 6:30am and determined that it was going to be one of those gray, drab, days. It wasn't raining but a light mist stayed suspended in the air throughout the morning. One of the things I enjoy most about the birding experience is enjoying the visual beauty of the birds. They are like living works of art set in a natural landscape and you get the added enjoyment of being able to observe their behavior as well. Of course the quality of lighting really plays an important role in what we see. On cloudy , gray days we just aren't able to see the color and detail that we can on a clear, sunny day. Having considered all this, I just wasn't in the mood to do any birding. I considered chasing after something that might have showed up on the rare bird report or just going back to bed for some much needed rest. I know that it is vital for me to spend time outdoors on the weekend so I settled on the idea of exploring a new trail in the area. 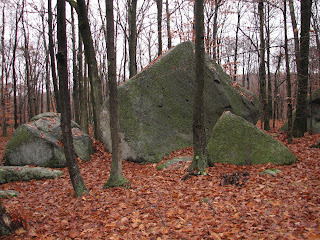 I checked in my Eastern version of The Connecticut Walk Book and found a listing for a portion of the Shenipsit Trail off of Birch Mountain Road in Glastonbury. There didn't seem to be many birds around. I did enjoy listening to the vocalizations of a large flock of European Starlings. With all the strange noises they make, it does seem to me that there is a lot of communication going on between these birds. I also saw another flock of about 30 Pine Siskins but they appeared as not much more than dark silhouettes in the top of a tree. I will say that I enjoyed looking at some of the rock formations and glacial boulders along the trail. The lack of light didn't diminish their appearance. My mind wanders on nearly birdless walks like these. I thought about all the unnecessary purchases that I made during the days when the economy was more robust (about eight years ago). I wish that I could return some of that unneeded junk and deposit the money back into a bank account. At least nature will always be there for us to enjoy free of charge regardless of what the economy is doing. Then I went on to consider the fact that when we're looking at stars, we are looking at light from years ago. I guess the same would hold true with objects that we see here on earth. It must take time, no matter how minuscule, for the light reflected off of an object to travel to our eyes. When we move forward, are we looking into the past or walking into the future? If I could empty the junk in my mind onto the trails that I walk, there would be no room for hikers. I saw this sign on my way out. It seemed to put things in perspective for the day. Sunday was the opposite of Saturday. It was all sun and no clouds. 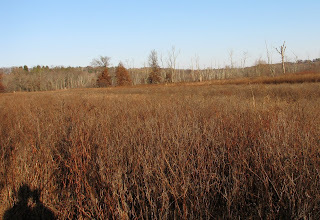 I made a visit to Dead Man's Swamp in Cromwell which is located between Main Street and the Connecticut River. There was no need to spend time thinking on a day like this. All I did was walk about the fields enjoying the birds and scenery. There were hundreds of sparrows in the field including White-throated, Swamp, Savannah, and my first Fox Sparrow of the Fall. Other species included Northern Flicker, Pine Siskins, Northern Harrier, 4 Red-tailed Hawks, Red-bellied Woodpeckers, Carolina Wren, Winter Wren, Belted kingfisher, and Brown Creeper. On this day, even commonly seen species were pleasant to look at. 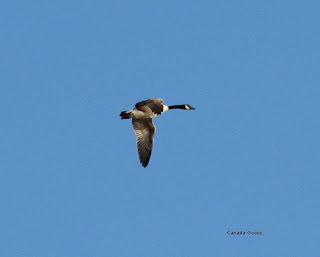 I watched Canada Geese pass overhead as the sun reflected off of their wings. American Goldfinches, even lacking their brilliant summer plumage, had me captivated. I must now end this post abruptly because the Library is closing. This post will probably contain plenty of errors since I had to rush through it. I can't wait to get my own computer back. Here is a video of a Brown Creeper creeping up a tree. They have a wonderful song if you happen to catch them at the right time of year. Most of the time they make this tiny ringing sound that you can hear quite well on this video. It is this sound that usually draws my attention to Brown Creepers before I actually see them. On Wednesday, the day after election day, I met up with Vern from Pennsylvania to do a little birding. He used to have an excellent blog called Big Spring Birds but decided to call it quits for now. I met Vern in Cromwell and after a brief introduction, we headed over to a pond in Meriden located on Research Parkway. I wasn't at my sharpest having stayed up late watching the elections. Vern was following me and I ended up taking a wrong turn or two but we managed to get to our destination in reasonable time. here were two ponds at the location but the one we were looking for was bordered by route 91. It was a busy area and the area around the pond had an ample supply of ticks. The pond itself, however was loaded with ducks, not ticks. There were about 100 American Wigeon in this small pond. The one Vern was looking for was a Eurasian Wigeon. After some careful searching using his scope, he found it-LIFER! There was also a couple of female Bufflehead, 2 Northern Pintail, and a Green-winged Teal in the pond along with various other goodies. Vern is a friendly laid-back sort of fellow that is easy to get along with. He also has a wry sense of humor and is an excellent birder as well. This is especially true when it comes to birding by ear. I can identify a lot of birds by their songs but Vern is able to identify a bird while it's still clearing its throat getting ready to sing! He is also very organized. He brought along a portfolio that included precise directions along with other information sealed in plastic protectors. I have information too, but its loaded up in a giant mound in the back of my truck. 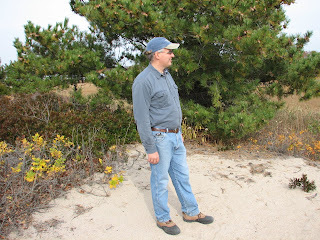 Our next stop was at Hammonasset State Park in Madison, CT. This is one of Connecticut's better birding spots but the birds were kind of quiet on this day. We did have some interesting sightings though. As we came to one marsh across from the nature center, a large brownish bird flew low across the marsh. Vern said that he was pretty certain it was an American Bittern. "We consider that a trashbird where I come from" he said. "Trashbird!" I said. "An American Bittern is a pretty good species to see in Connecticut!" Apparently, bitterns are so common in the marshes in Vern's area that they have to spray the canoes with bittern repellent in order to be able to make their way through the water! We also saw a few raptors around the park including a Merlin, Cooper's Hawk, and a Northern Harrier. There were also plenty of Great Egrets and Snowy Egrets around. Birding on the Willard's Island trail was very slow but we did see a Hermit Thrush on the way out. We had some interesting sightings over at Meig's Point. Vern Spotted a Ruddy Turnstone out on the rockpile and we had a close view of some Sanderlings along the beach. We saw some loons out in the distance and finally decided that they were Common Loons. We walked along another trail that bordered the shoreline. We saw a dark headed bird that flashed a lot of white when it flew. Upon further investigation, it turned out to be a White-winged Scoter. We walked further along the trail, and saw some more birds off in the distance. I could make out some white on the backs of their heads and wondered if they might be Buffleheads. When we looked at them through the scope, there was no mistaking that they were Surf Scoters. We had a great look at them. Neither of us had seen them from such a close distance before. They have really bold white markings on the front and back of their heads along with a very distinctive bills. Some birders call them Skunk-headed Coots. This was my favorite sighting of the day. What unusual looking birds. I can't remember if there were six or eight of them because I don't have my notes with me here at the library but it was a treat to see them. We ended our search in the West Beach area of the park. There had been a Nelsons Sharp-tailed Sparrow reported there. We searched the area where it had been reported along a marsh but if it was there, it wasn't cooperating. We saw a few suspect sparrows pop up but after that they stayed deep under cover. One last bonus for Vern was that he saw his first Monk Parakeets in North America. We could see the lime-green birds flying off . They sounded a little bit like terns we thought. We didn't see a lot of species-only about 35 or so but we had fun. We decided to call it quits and headed over to the nearby Fishtale Restaurant. I had some scallops and Vern had fried clams. It was a nice way to end the morning. 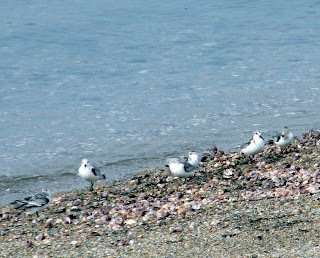 Vern continued on to Rhode Island after that as part of his whirlwind New England birding tour. He also planned to go Maine and up to northern Vermont looking for Boreal species. Good luck Vern-It was a pleasure meeting you ! After Vern left, I started thinking about how we had missed out on that Nelson's Sparrow. I decided to go back to the park and search for it one more time. I went back to the same spot and after 10 minutes of searching, there it was! -Nothing! Again! I did see some other birds that had eluded us before though. 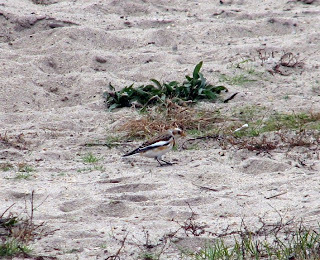 There were 14 Snow Buntings in a lot that was further back than we had searched previously. I also saw an Eastern meadowlark which was actually very interesting to me. At first, it stayed in deep grass and all I could see was the back of it. I never had a close-up view of one and all I could remember was the bright yellow belly. I noted a bird with a boldly striped back of the head and long bill that was acting very strangely. 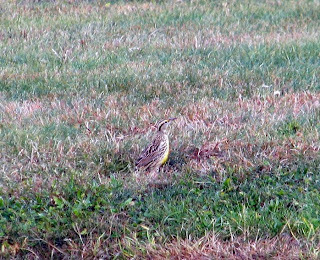 When it emerged, I was kind of surprised to see that it was a meadowlark. I was also struck by how conspicuous the white on its tail feathers were. It kept flicking and flashing the white on its tail. It was also larger up close than I would have imagined. The last birds that I saw on the way out were a group of Black-bellied Plovers in a grassy portion of one of the parking lots.